Little White Rabbit by Kevin Henkes follows a common theme found in early literacy. Little White Rabbit wonders what it would be like to be different. What if he could be tall like the trees or flutter like a butterfly? What if he were green or stone-like? Little White Rabbit enjoys his adventure and his imaginings until he is scared by a cat. Then he runs home, safe to his mother's arms. I think this may be one of the best new books of 2011 so far. For our story craft, I thought it would be fun to "find" a hidden rabbit. 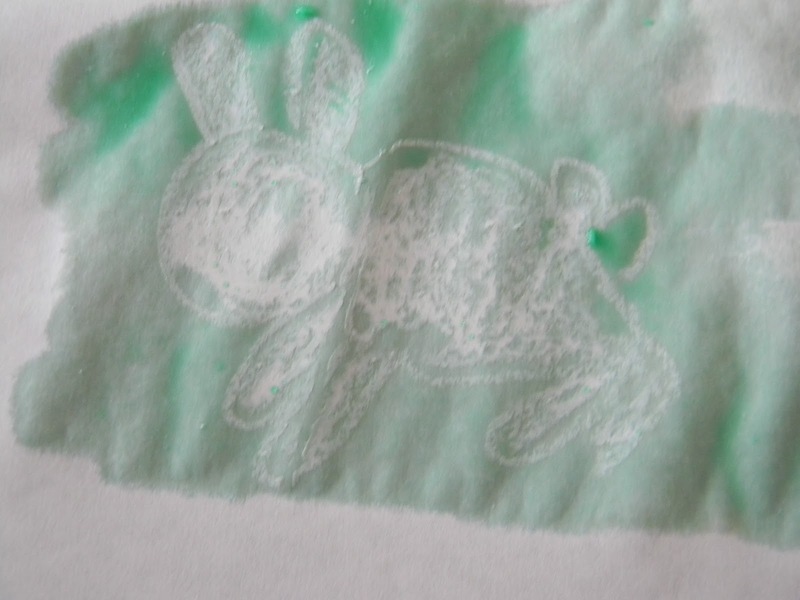 Before we began our project, I drew little white rabbit on white paper with white crayon. 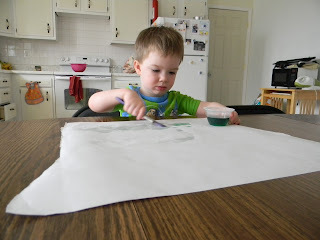 Then I let Logan paint the paper with watered down green food coloring. As he painted, the Little White Rabbit appeared. Finding hidden pictures can be a great way to introduce any new theme to your child! Brimful Curiousities recently did a review/craft on this book too. Check out her folded paper bunny-- great for kids a little older than mine! And look at these darling handprint and footprint bunnies at Getting Messy with Ms. Jessi. We'll definitely be making these! What a fun craft! And thanks for the tips on how to get it to actually work! So much fun! We love finding hidden things like this! My daughter calls this magic painting... we love it!! 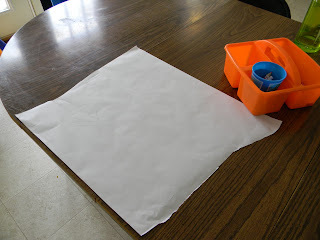 Thanks for linking up to Kids Get Crafty! Much appreciated! This is one of my favorite books of the spring. Love your resist art. We used a similar technique for our stArt project today. We also had little success with resist art, but I think it's because both crayons and watercolor were cheap $1 stuff. Watercolors were not bright enough to bring out the lines. We love everything by Kevin Henkes, and I agree that this book is lovely. We really enjoyed it. Love the new ideas! I hope to see you link it up this week on Made by Little Hands Monday! Visiting from the We Teach link!! I love the idea of invisible pictures!! Very fun! My kids love coloring with white crayon and then painting. This looks like a great book. I haven't read it yet. I'll be looking for it at the library. I love the idea of "finding hidden pictures"! It sounds a lovely book. What fun! I love this idea! I need to do one with JDaniel! We love magic painting at our house too. We can't wait to check out this book. Bunnies are pretty popular with my littlest one. Thanks for joining the Virtual Book Club! great idea! i'm thinking of drawing a bunch of little white bunnies, so the kiddos can count how many they've found :) thank you for the inspiration!